I have a portable filing cabinet that houses all the recipes that I've gathered over time and it's heavy, really heavy. The recipes are separated into categories (breakfast/breads, sweet treats, main dishes etc.) and then split into two separate categories of "have made" and "haven't made, but want to." Often a recipe that I find ends up in the "haven't made, but want to" category and stays there for quite some time. Other times I find a recipe that I immediately know that I have to make very soon, like right now soon. 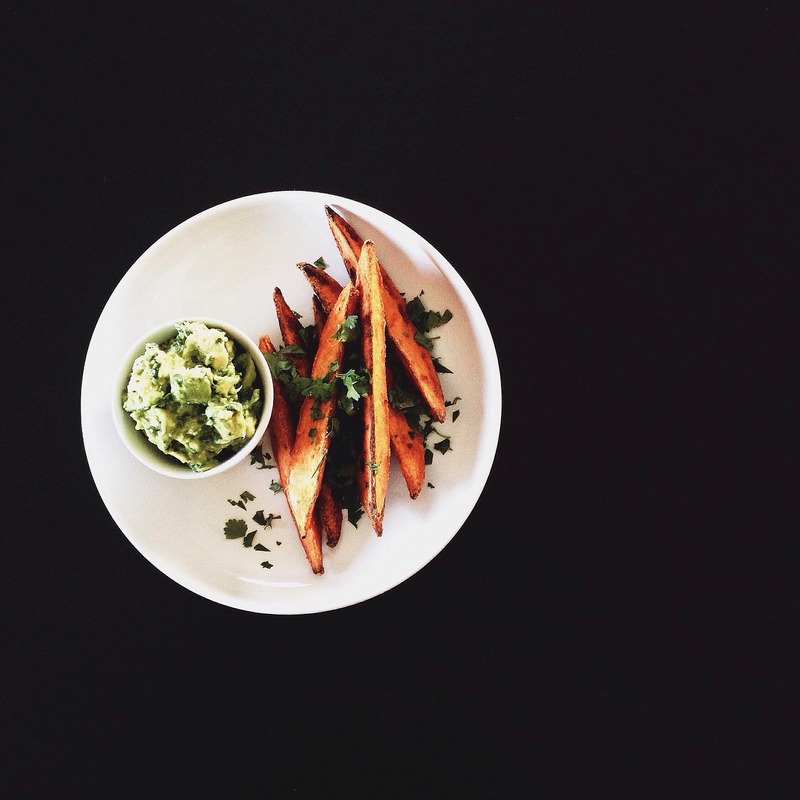 These sweet potato wedges with avocado chimchurri fell into the make me right now category. After a quick trip to the grocery store I found myself in a place where I feel most comfortable, the kitchen. I don't have amazing knife skills, but my knife feels comfortable in my hand (sometimes too comfortable). In no time at all I'm breathing in the smells of fresh lime juice, cilantro, jalapenos, vinegar, and garlic that fill my kitchen and I feel happy inside. As I toss the sweet potatoes with the olive oil and smoked paprika I watch my fingers turn a burnt red color from the paprika. Before I pull the sweet potatoes from the oven I quickly halve two avocados and take a moment to admire their lovely green color (it never gets old). I quickly dice the avocados into a bowl and add a large spoonful (or two) of the chimichurri and give it a gentle mashing. I take a bite and my heart skips a beat, I am in heaven. The avocado chimichurri is creamy, bright, and fresh with a little heat. I pile the sweet potatoes hot from the oven onto a plate and watch my finger quickly sprinkle them with cilantro. I immediately knew I needed to share this deliciousness with someone and Todd was working upstairs. He may have been a bit surprised when I handed him a plate of sweet potato wedges instead of a sandwich for lunch, but not that surprised because he knows me well and will happily share a plate of sweet potato wedges and avocado chimichurri with me for lunch. Preheat oven to 425 degrees F. Wash and dry the sweet potatoes and cut them into 1 1/2" wedges. Place the sweet potato wedges and cornstarch into a large Ziploc bag and toss to coat. Dump the wedges onto a large rimmed baking sheet and drizzle with the olive oil, smoked paprika, and salt. Toss everything to coat with your hands and spread wedges into a single layer. Bake in the upper third of the oven for 30 minutes or until the edges are just browned. While the sweet potatoes are roasting, prepare your sauce. Place garlic, green onions, and salt into the bowl of a food processor and run until well chopped. Add the jalapeno and pulse a few times to chop. Add the cilantro, parsley, vinegar, lemon juice, and oil and pulse a few more times until roughly combined. Dice the avocados and put them into a mixing bowl. Add a few spoonfuls of the chimichurri and gently mash it into the avocados (I like to leave mine chunky), adding more chimichurri to taste.